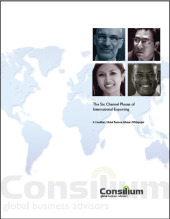 Free Whitepaper "Six Critical Phases of Channel Management"
Managing channel partners for sales effectiveness is often mentioned as the most frustrating element of international business. Too often an adversarial dynamic evolves...followed by frustration. And anticipated market growth never seems to materialize.